Avoid kangaroos, road trains, dust devils, and other solar cars! How do I improve the graphics? Go into the game's installation directory, C:/Program Files/U-M Solar Car/Solar Car Raycing. Open up zeniapp.ini in notepad. Set Width and Height to your monitor's resolution. Increase Anisotrophy and Multisampling as appropriate. How do I run in a window? 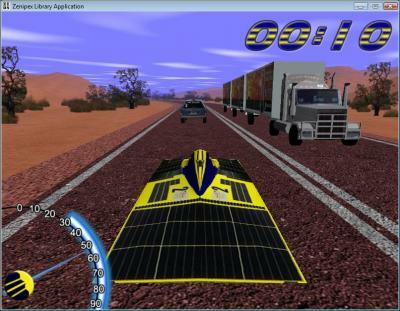 Go into the game's installation directory, C:/Program Files/U-M Solar Car/Solar Car Raycing. Open up zeniapp.ini in notepad. Set FullScreen to 0. How do I change views in the game? Press the C key on the keyboard while driving. This will cycle between 3rd person view (default), 1st person view, and chase vehicle passenger view. How do I check the frame rate of the game? Press the Insert key on the keyboard while driving. The game doesn't run or the window closes! Go into the game's installation directory, C:/Program Files/U-M Solar Car/Solar Car Raycing. Open up stderr.txt. Check this FAQ to see if that error is listed. Otherwise, use the contact page to send us the error! My high score doesn't appear?! Go into the game's installation directory, C:/Program Files/U-M Solar Car/Solar Car Raycing/config. Right click high_scores.txt and go to properties. Find the security and permissions tab. Make sure your user name has full access privileges to the file.